Exclaimer Cloud - Signatures for G Suite lets you create email signatures in minutes, all you need is a modern web browser to get started. Create multiple G Suite email signatures - Whether you have 5 users or 100,000 users, you can create multiple signatures for your users. Signatures can be applied to individual users, Google Groups, a domain or the whole organization. No need to be an IT expert - The Exclaimer Cloud UI is designed for users of all technical abilities, and doesn’t require any HTML or design skills to build a professional Gmail signature. Real-time changes - Any changes you make to signatures will be instantly updated, and you can see the changes instantly in the signature preview panel. The updated G Suite signatures are deployed to users as soon as you click ‘Save’. 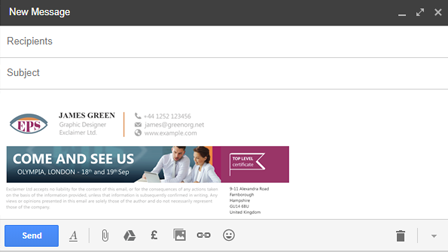 Choose a pre-built signature template - Exclaimer Cloud also comes with a library of pre-built email signature templates. Make the signature your own by adapting the templates to fit your organization’s brand. Personalize users’ signatures - Add a face to a name with the user photo feature. Make your professional Gmail signatures more personal with centrally managed user photos. Include your company’s logo and custom font. Display award and certificates with HTML images. Add trackable hyperlinks to capture link click data. Include promotional banners to align with marketing campaigns. Get new followers for free with social media icons. Schedule email signatures with the time-and-date feature. Gmail signatures are controlled from a central, web-based location. Give access to multiple users, and assign editor or admin permissions. Group signatures into folders, restrict access to certain admins/editors and make sure the signatures in the folder only apply to specified users. 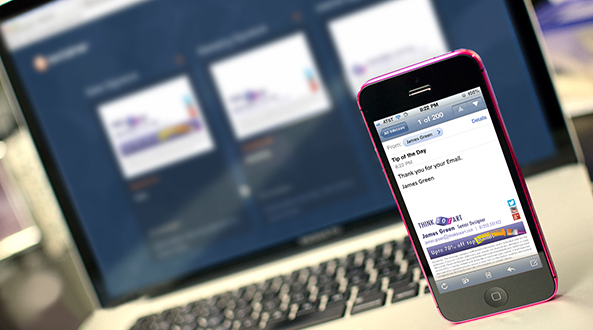 Signatures can be applied based on the recipient's domain or a single user's email address. Assign signatures to everyone, individual users or Google Groups. Set a signature to be applied to emails sent to external and/or internal recipients. Add user photos to personalize Gmail signatures. Try the Signature Editor before connecting to G Suite. See changes to your signature instantly in the preview panel. Choose from pre-built templates and make it your own. Accredited with the ISO 27001 certification for Information Security Management. Gmail signatures are applied to emails sent from all web-enabled devices. Highest levels of security including 2-factor authorization and 24/7 monitoring. Connects directly to your Google Directory for all user contact details. Sign up for real-time service health notifications. Datacenter failover if an issue occurs at an Exclaimer regional datacenter. The signature rules tester allows you to see which email signature will apply for a certain user. When using the Gmail web app, G Suite users will be able to see their signature whilst composing an email. Contact details are pre-populated with user information taken from your organization’s Google Directory, meaning they’ll always have the correct details in their signature. Your organization’s signatures in Gmail are centrally managed through a web portal, which is accessible from any device. You have complete control over the email signature style, and which G Suite users get each signature. You also have the option to assign administrator or editor rights to specific Exclaimer Cloud users, and add permissions to folders. This is ideal if you work in a large organization or have multiple office locations, as it ensures your G Suite email signatures are being dealt with by the correct person. Whether you’re a BYOD organization, or have multiple remote workers, using Exclaimer Cloud - Signatures for G Suite ensures every G Suite user gets a professional, branded email signature on every email sent from a web-enabled device, including Macs, mobiles and tablets.